WHY is it important to get my diabetes under control? 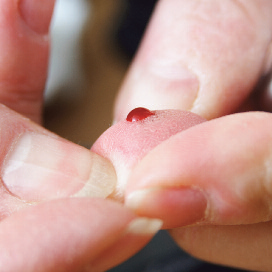 Long standing diabetes causes damage to the small blood vessels that in turn damage the kidneys. The kidneys then start to ‘leak’ protein, which can be found on routine urine testing. About one third of people with diabetes will get some form of kidney disease. Keeping your blood glucose levels as near normal as possible (between 4 and 6 mmol / l before meals, and less than 10 mmol/l two hours after food) with tablets and/or insulin, together with good blood pressure control and cholesterol control, can greatly reduce the risk of your kidney disease getting worse. It will also reduce the risk of developing other vascular diabetic complications such as stroke, heart attack, foot ulcers, and eye problems. HOW can I improve my diabetic control? You will need to work in partnership with your diabetes healthcare team which may include several healthcare professionals in different settings depending on your needs. However, you should know the name of your key contact person who you are likely to see most often. This person will be able to co-ordinate your care and agree with you some realistic goals and a plan to achieve them. Many people with diabetes and CKD will need tablets to reduce the protein being lost in the urine through the kidneys. There are many types of medications available and your doctor will discuss with you which type may suit you best. It is likely that you will need to take these tablets for the rest of your life and you should not stop taking them without talking to your kidney and diabetes doctor or GP. Blood glucose levels should be as near as possible to between 4 and 6 mmol /l before meals, and less than 10 mmol/l two hours after food. HbA1c (which indicates your blood glucose levels for the previous two to three months) should be below 50 mmol /mol. Cholesterol levels should be 4 mmol /L or below. Blood pressure should be 130/70 or below.